Overfilling of the fuel tank may create pressure in the system which could cause a gas discharge. This could cause the gasoline to spray back out when removing the fuel pump nozzle, which could cause personal injury. Do not fill diesel tanks with gasoline. Do not mix diesel fuel with gasoline. Otherwise the fuel system and engine could be damaged. In addition, the vehicle could catch fire. Do not use gasoline to refuel vehicles with a diesel engine. Do not use diesel to refuel vehicles with a gasoline engine. Even a small quantity of the wrong fuel will damage the fuel system and engine. Do not switch on the ignition if you accidentally refuel with the wrong fuel. Otherwise, the fuel will enter the fuel lines. Notify a qualified specialist workshop and have the fuel tank and fuel lines drained completely. You should only refuel with premiumgrade unleaded gasoline, as this avoids damaging the catalytic converter. Flexible fuel vehicles, identifiable from the label inside the fuel filler flap, can be refueled with E85. For further information on flexible fuel, see "Fuel". If engine running problems are apparent, have the cause checked immediately and repaired. Excess unburned fuel can otherwise enter the catalytic converter, leading to overheating and possibly causing a fire. Only refuel with premium-grade unleaded gasoline with a specified minimum octane number of 91 (average value of 96 RON/86 MON). You will usually find information about the fuel grade on the pump. If you cannot find the label on the pump, ask the staff for assistance. You can find more information under "Fuel", or by contacting an authorized Mercedes-Benz Service Center or visiting http://www.mbusa.com (USA only). Only refuel with ULTRA-LOW SULFUR DIESEL FUEL (ULSD, 15 ppm SULFUR MAXIMUM). Using other diesel fuels could result in increased wear and damage to the engine and/or exhaust system. Never refuel with marine diesel or heating oil. Do not mix these fuels with diesel fuels and do not use any special additives, as this may result in damage. Use a filter when adding fuel from a fuel can. Otherwise, the fuel lines and/or the fuel injection system could be blocked by particles from the fuel can. Usually, you will find information about the fuel grade on the pump. If you cannot find the label on the gasoline pump, ask the gas station staff. You can find more information under “Fuel”, or by contacting an authorized Mercedes-Benz Service Center or visiting http://www.mbusa.com (USA only). Do not use gasoline to refuel vehicles with a diesel engine. Never mix diesel with gasoline or kerosene, as this may result in damage to the engine or fuel system. Diesel fuel with improved cold flow properties is available during the winter months. Further information on fuel properties can be obtained from oil companies, e.g. at gas stations. The fuel filler flap is unlocked or locked automatically when you open or close the vehicle with the SmartKey or using KEYLESSGO. - Remove the SmartKey from the ignition lock. KEYLESS-GO: open the driver’s door. This switches the ignition to position 0, which corresponds to having removed the SmartKey. The driver’s door can be closed again. - Press the fuel filler flap in the direction of arrow 1. - Turn the fuel filler cap counter-clockwise and remove it. - Insert the fuel filler cap into the holder bracket on the inside of filler flap 2. - Completely insert the pump nozzle into the filler neck and refuel. - Only fill the tank until the pump nozzle switches off. - Replace the fuel filler cap and turn it clockwise. The fuel filler cap audibly engages. - Close the fuel filler flap. If you drive with the fuel filler cap open, reserve fuel warning lamp flashes. lamp may light up. A message appears in the multifunction display. For further information on warning and indicator lamps in the instrument cluster. The fuel line or the fuel tank is defective. - Turn the SmartKey to position 0 in the ignition lock immediately and remove it. - Do not restart the engine under any circumstances. The fuel filler flap cannot be opened. The fuel filler flap is not unlocked. The SmartKey battery is discharged. - Unlock the vehicle using the mechanical key. The fuel filler flap is unlocked, but the opening mechanism is jammed. The engine will not start. The fuel tank of a vehicle with a diesel engine has been run completely dry. - Refuel the vehicle with at least 5.3 US qt (5 liters) of diesel. - Turn the ignition on for at least 10 seconds. - Start the engine continuously for up to 10 seconds until it runs smoothly. If the engine does not start: - Turn the ignition on again for approximately 10 seconds. - Start the engine again continuously for up to 10 seconds until it runs smoothly. If the engine does not start after three attempts: - Consult a qualified specialist workshop. When the DEF supply has almost run out, the Check Additive See Operator's Manual message is shown in the multifunction display. When the DEF supply sinks to a minimum level, the Remaining Starts: 16 message is shown in the multifunction display. When the Remaining Starts: 16 message is shown in the multifunction display, you can start the engine 16 more times. If DEF is not added, it will not be possible to restart the engine. Fill the DEF tank with approx. 1 gal (3.8 l) DEF, or have it filled at a qualified specialist workshop. If you drive the vehicle faster than 10 mph (16 km/h), the Check Additive See Operator's Manual message goes off after approximately one minute. - DEF does not come into contact with skin, eyes, or clothing - to keep DEF out of the reach of children If you and/or others have come into contact with DEF: - If DEF has gotten into contact with eyes, flush with plenty of water immediately and seek medical help. - Clean affected skin immediately with plenty of water. - If DEF was swallowed, rinse mouth immediately with plenty of water and drink plenty of water. Consult a physician. If you open the DEF tank cap, small amounts of ammonia vapor may be released. This depends in particular upon the age of the DEF. You may experience a burning sensation in your eyes, nose and throat, as well as coughing and watering of the eyes. Do not inhale any ammonia vapors that may be released. Fill the DEF tank only in wellventilated areas. If the outside temperature is lower than - 11 °C, damage may occur when adding DEF. If DEF is frozen and there is an active warning indicator, adding may not be possible. Park the vehicle in a warmer place, e.g. in a garage, until DEF has become fluid again. Filling is then possible again. Alternatively, have the DEF tank refilled at a qualified specialist workshop. The filler neck for DEF is behind the fuel filler flap. - Switch off the ignition. - Turn blue DEF filler cap 2 counterclockwise and remove it. DEF filler cap 2 is secured with a plastic strap. DEF refill bottles can be obtained at many gas stations or at an authorized Mercedes-Benz Center. Refill bottles without a threaded cap do not provide overfill protection. DEF may leak if overfilled. Mercedes Benz provides special refill bottles with threaded caps. - Unscrew the protective cap from DEF refill bottle 1. 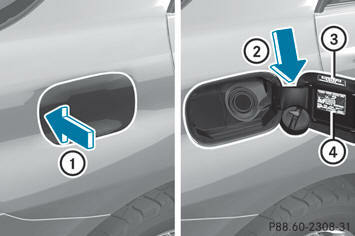 - Place DEF refill bottle 1 on the filler neck as shown and screw it on clockwise until it is hand-tight. – Press DEF refill bottle 1 in the direction of the filler neck. – Release DEF refill bottle 1. – Turn DEF refill bottle 1 counterclockwise and remove it. – Screw on the cover of DEF refill bottle 1 again. – Place DEF filler cap 2 on the filler neck and turn it clockwise. 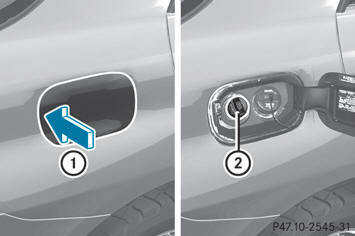 – To close the fuel filler flap, press it in the direction of arrow 1. – Drive at a speed above 10 mph (16 km/h). The Check Additive See Operator's Manual message disappears after approximately one minute. If the Check Additive See Operator's Manual message continues to be shown in the multifunction display, you need to add more DEF.